This equipment is broadcasting fertilizer to build overall soil fertility. Photo: Andy Harper. An important way farmers can conserve energy is making efficient use of fertilizers and other nutrient sources. This article will introduce farmers to the concepts of fertilizer energy and efficient nutrient use. It discusses how to optimize fertilizer use by soil testing, fertilizer placement, and application and by using farm manures and cover crops as part of a soil fertility plan. It includes a discussion on the impact of nutrient carry-over and crop rotation on fertility planning. Thoughtful use of these management practices will help farmers conserve energy and save money. Fertilizer Energy Use in the U.S. It is estimated that less than 1% of the total U.S. annual energy consumption is presently being used for fertilizer production, yet this still represents nearly 500 trillion BTUs. The production of nitrogen fertilizers, which requires approximately 25,000 BTUs per pound of nitrogen, represents more than three-fourths of the total energy used for all fertilizer production. Energy consumption values for phosphate and potash fertilizer are estimated at 5,600 BTUs per pound of phosphate(P2O5) and 4,700 BTUs per pound of potash (K2O). Energy use for the production of fertilizer is not the entire story. Energy is also required for transporting fertilizers to the dealer and then to the farm and for application. Energy use for transportation varies greatly, depending on the fertilizer source being shipped, the methods of transportation, and the distance traveled. Approximately 1,600 BTUs are required to move one ton of fertilizer one mile by rail or barge and nearly 4,000 BTUs per ton one mile by truck. Pipelines are another means of transporting ammonia fertilizer and should be included in any energy-cost analysis. High-analysis fertilizers generally require more total energy for production but less energy per pound of actual nutrient and for transportation. Although fertilizers are expensive and consume large quantities of energy, they also help plants utilize the sun’s energy more efficiently. Green plants capture energy from the sun by the process of photosynthesis and store energy as carbohydrates, oil, and protein, which eventually are available for human and animal consumption. Quite often, plants cannot absorb the maximum energy from the sun without the use of fertilizers. A bushel of corn contains approximately 400,000 BTUs of energy; therefore, each pound of nitrogen must increase yields 0.0625 bushels to return the amount of energy required to produce one pound of nitrogen (25,000 BTUs). Putting it another way, 6.25 bushels of corn contain as much energy as 100 pounds of nitrogen. Quite often, a farmer can expect a 40- to 50-bushel increase in yield with 100 pounds of nitrogen. Thus, it is easy to see that fertilizers are energy efficient, often resulting in a far greater return of energy than expended, but that energy increase does not diminish the importance of optimizing the efficiency of fertilizer use. At the critical level, yield returns decrease with subsequent fertilizer additions. Diagram: PSS eLibrary. One of the most important ways the grower can conserve fertilizer energy is making efficient use of fertilizer. Economists generally recommend that increasing amounts of fertilizer should only be used when the additional value of yield realized exceeds the cost of nutrients applied. Efficient use can be defined as maximizing yield with a minimum amount of fertilizer. The greatest efficiency usually results from the first increment of added fertilizer/nutrients. Additional increments of fertilizer/nutrients usually result in a lower efficiency but may be profitable. A grower who wants to maximize profits will usually sacrifice some fertilizer efficiency. Fertilizer is an important source of plant nutrients required for optimal plant growth. The soil and its organic matter derived from plant residues and manures, however, also supply a large portion of the nutrients essential to growing plants. Soil testing is a means of evaluating the soil’s ability to supply these nutrients. Some soils are naturally fertile or have been made more fertile by the use of fertilizers or other nutrient sources. An assessment of what the soil can supply can be related to crop yields and is used extensively for making fertilizer and lime recommendations. Soils that test low in phosphorus (P) or potassium (K) will need larger amounts of fertilizer P and K than soils testing high in these two nutrients. Much fertilizer energy can be saved by soil testing if fertilizers are applied to soils that have the greatest need and by using reduced rates where soil reserves are high. More specific savings and efficiencies have been realized in recent years with the advent of precision farming concepts and equipment, more specifically testing soils on a smaller area basis and using GPS guidance systems and variable rate applications to more precisely apply fertilizers. Liming soil to the optimal pH for a crop helps makes nutrients more available, thus reducing the need for fertilizers. Photo: Vern Grubinger, University of Vermont Extension. Limestone is an important source of the essential nutrients calcium (Ca) and magnesium (Mg). It is commonly used to raise the soil pH, which is a measure of soil acidity or alkalinity. Nutrient availability to plants is often affected by soil pH, with the greatest availability generally occurring between pH 6.5 and 7.0. For example, on acid soils (below 5.5), soluble aluminum is toxic to many plants and reduces the availability of P fertilizers. On alkaline soils, P availability is also reduced, resulting in reduced fertilizer efficiency and crop yield. Liming acid soils will also improve nodulation of legumes and increase fixation of atmospheric nitrogen, thereby reducing added N fertilizer requirements. It has long been known that banding (placing fertilizer near the seed at planting) is more efficient at supplying nutrients to the crop than broadcast applications, yet some crop producers have moved away from band applications. One of the reasons for this shift is that many crops no longer respond to P and K fertilizers where soils are already high in these nutrients. 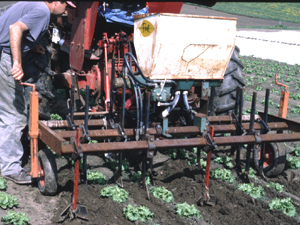 This equipment is used to sidedress lettuce while cultivating for weed control. Photo: Vern Grubinger, University of Vermont Extension. Another reason for the shift from band to broadcast fertilizer is the increased labor cost and time involved in band application. As an example, corn yields are greatly affected by time of planting. Any operation which delays planting, such as filling fertilizer hopper/tanks, can slow planting time, causing a reduction in yield and resulting in a significant economic loss. Before one switches from banding to broadcasting, a thorough analysis of band applications should be made. Banding usually means less fertilizer per acre and fewer trips across the field and may mean higher yield per acre. Estimates of additional time involved in banding fertilizers are as low as 30 seconds per acre. As farmers become better equipped to handle bulk blended or liquid fertilizers for use in planters, and as fertilizer prices continue to escalate, banding will become more efficient and economical. 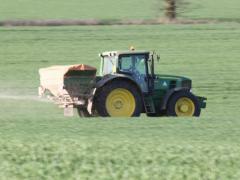 Uniform application of broadcast fertilizer is important in maximizing yields. Non-uniform application of dry bulk blended fertilizers, due to segregation or separation of nutrients in loading, hauling, and spreading, can result in overfertilization or underfertilization of certain nutrients and areas in the field. The result is reduced yield, lower fertilizer efficiency and wasted energy. Liquid fertilizer, which generally has a higher cost of production due to larger inputs of energy, would appear to have some advantages when considering uniform application and efficient use. Thus, the larger cost for energy for producing liquid fertilizer may be offset by greater efficiency due to more uniform application. Poor spreading patterns can also cause over- or underfertilization. Again, precision agriculture methods using GPS and similar means can greatly reduce this variation. Sidedress applications of nitrogen (N) applied after plant emergence – particularly on shallow-rooted crops such as potatoes grown on sandy soils which are subject to leaching, or on crops grown on fine-textured soils where denitrification is a problem – may be used advantageously to increase effectiveness of fertilizers. Agronomic research has shown that delaying the time of N application will generally result in better usage of N.
Corn and potatoes are good examples of crops having a high requirement of N later in the growing season. Sidedressed N will help to assure that N will be plentiful during the later stages of growth. In some cases, such as fields receiving manure, adequate N may be available throughout the growing season without further N application. Over the last decade or more, a pre-sidedress N test (PSNT) has been available for corn and other crops to determine actual need for supplemental N. Use of this test could significantly reduce N use and therefore energy and any potential pollution. Applying N through the irrigation system is another means of improving nitrogen efficiency. Such a procedure requires little additional energy for application and assures that adequate nitrogen is available during the plant’s greatest period of use. This practice is well adapted to sandy soils where leaching of N is a problem. Spreading manure on hayland provides nutrients and organic matter. Photo: NRCS. Manure is an organic nutrient source available on poultry and livestock farms. Often equivalent to a low-analysis fertilizer, it thus requires a great deal of energy for uniform distribution to the field but should be effectively utilized whenever possible. The nutrient composition of manure varies greatly, depending on the type of livestock and the methods of handling and spreading. 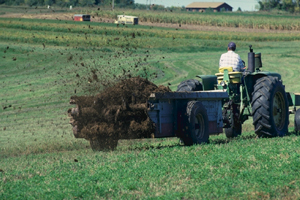 Incorporation of manure immediately after application will reduce volatilization losses of ammonia nitrogen and nutrient runoff from manure and result in better nutrient recovery. Incorporating a legume crop such as alfalfa in the crop rotation is an excellent way of improving the N status of the soil. Legumes fix atmospheric N by a process called symbiotic N fixation. Therefore, roots and nodules rich in N when plowed under release readily available N for other crops. This field of biennial sweet yellow clover was grown as a cover crop to enhance soil fertility and provide N to a subsequent vegetable crop. Photo: Vern Grubinger, University of Vermont Extension. Fertilizer N recommendations should be adjusted for the amount of N returned by the legume residue. 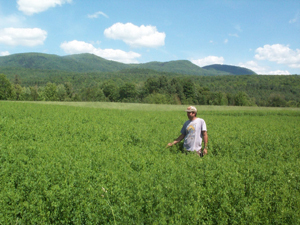 A good stand of alfalfa, when plowed under, will supply 80 to 100 pounds of N per acre. A poor stand of less than 30 percent alfalfa will supply no more than 40 pounds of N per acre. A good stand of clover will supply 40 to 60 pounds of N. Soybeans in the southern United States may supply up to 40 pounds of N to next year’s crop with less supplied by soybeans grown further north. Fertilizer residue and manure nutrients often carry over from one year to another. More carry-over can be expected with high application rates and following droughty years. Yield reduction due to drought, poor stand, or insect or disease problems often results in less nutrient uptake and removal, which can significantly influence the carry-over of fertilizer. Nutrient carry-over from crop residues and manured soils also contributes to the fertility of the soil. Not all of the nutrients in manure are released in the first year of application. Only half the N and P are considered available in the first year of application, but all of the K should be available in the first year. Crop rotation is also important in using fertilizer efficiently. A low nutrient-requiring crop such as soybeans following a heavily fertilized corn crop may require little or no fertilizer. Such practices are common and helpful in utilizing fertilizer efficiently. Although the amount of energy used for the production of fertilizer is relatively small compared to the total U.S. energy consumption, conservation wherever possible is important. Considerable energy can also be expended in transporting and applying fertilizers. Fertilizers, however, help conserve energy by improving the crop’s ability to capture the sun’s energy and store it as plant energy. Agricultural producers have many opportunities to make efficient use of fertilizers. 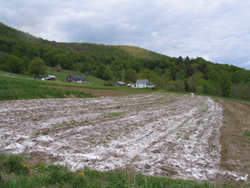 Management practices such as liming, soil testing, band placement of fertilizer, uniform applications, timing of nitrogen application to coincide with the crop’s period of greatest use, use of manure, legumes, carry-over fertilizer, and advantages of certain crop rotations can all help to conserve energy. Vitosh, M.L. 1977. Fertilizer Management to Save Energy. Energy Facts, Ext. Bull. E-1136, Cooperative Extension Service, Michigan State University, East Lansing, MI (out-of-print). Schnepf, R. 2004. Energy Use in Agriculture: Background and Issues. CRS Report for Congress. Hoeft, R.G. and J.C. Siemens. 1975. Do Fertilizers Waste Energy? In: Crops and Soils, American Society of Agronomy, Madison, WI.